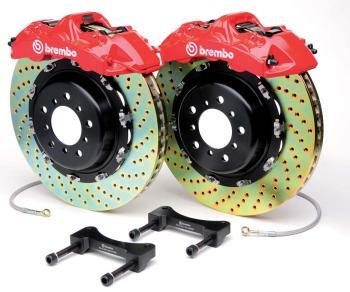 The Brembo Gran Turismo (GT) Brake Kits? level of technology and performance is unrivaled by any other product on the market. By utilizing larger calipers and discs, thermal capacity and brake torque is increased. This potent combination offers the extreme in Brembo?s leading edge technology for high performance street or track use applications. Brembo billet caliper mounting brackets. Brembo Gran Turismo (GT) one piece rotor systems offer a cost effective solution to the high performance brake upgrade. Includes oversized calipers and discs for increased brake torque and thermal capacity. These performance upgrades are available for many European, domestic and import vehicles. Found exactly what I needed (in-cabin air filter) that was difficult to find. Transaction went smooth and was great I got to pay with Amazon payments. Great shopping experience! This was the first time I used them and the shipping was fast and the price was great would recommend them to anyone looking to buy car parts online. Great customer service and even better prices,had to have a new e-boost2 by the weekend,and they made it happen. I am really impressed. I placed my first order on Monday evening about 7:30 pm and it was delivered to my front door today (Wednesday morning), less than two days later. And that was with ground shipping! On top of that Autoplicity had one of the best prices. I WILL be ordering again from them. I liked it, I will return. I highly recommend Autoplicity for any of your vehicle needs. They have some of the lowest prices on the web and super fast shipping, I absolutely will be shopping here for all my future auto needs. Great price on the Defi gauges that I wanted. I placed my order at 2 PM and asked if it could be shipped that day. Said that they would do their best. Shipped that same day. UPS 2 day day is only taking one day to Noerthern Virginia. Great Prices and really fast shipping. Keep up the good work.